Creating a PDF file from a document in any application is easy. Simply select "docPrint PDF Driver" or "docPrint" as your printer from the print menu, then, print your file to PDF. 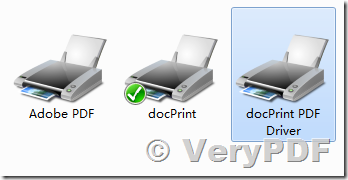 What is Virtual PDF Printer? Virtual PDF Printer simplifies the process of creating PDF document. Usually PDF documents are created by specific PDF composer software. However, it might be time-consuming compared with the alternative approach, which creates PDF documents from other file formats. With Virtual PDF Printer, it is easy to create PDF documents from Word, Excel, PowerPoint, WordPerfect, Photoshop and other Windows applications. Virtual PDF Printer natively supports over 300 file formats and customers wouldn't expect anything less. What can I do with Virtual PDF Printer? 1. Create PDF document with the conversion approach. 2. Convert any document to PDF document using Virtual PDF Printer. 3. Make it easy to delivery your document worldwide. How to suppress "Run VeryPDF Batch PDF Editor Tools to process printed PDF file" message box in docPrint Pro v6.0? This entry was posted in docPrint Pro, PDFcamp Printer and tagged pdf creator, PDF Printer, pdf printing, virtual printer.. Bookmark the permalink.